Anyone see a resemblance here? 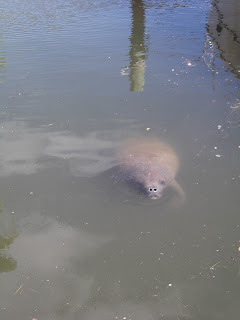 This is probably the shortest post I've ever written but today I was finally able to get a picture of Baby Manatee. I took Wilbur with me and it was all I could do to hold him back from jumping over the sea wall. I'm sure he thinks it's a a lucky pup that gets to swim in the marina every day and he soooo wants to play with his friend. We just realized that a year ago in August we gave up our apartment and with both our vehicles loaded to the point of bursting (Wilbur rode with me), we made the two day trip from Pennsylvania to Florida. We then moved our Knotty Cat through the Okeechobee Waterway to our new stomping grounds (that wouldn't have happened this summer as the one fixed bridge in the Okeechobee is now at 49' and we have a 50' mast). I still can't call us cruisers at this time because we're living in limbo at a marina which is basically a trailer park on the water, but we're thankful that if we have to be stuck anywhere, at least we're on our boat. Even though it's still hotter than hell. We were just a bit more prepared for the heat this year though; we had a sun shield type of thingy made for the Knotty Cat that covers her wrap-around windows, we bought some outdoor curtain panels from Home Depot and draped them over our boom and over a rope strung from the mast to the jib so the boat ended up looking like a giant tent (all were removed for Isaac the No Show Hurricane), I made hatch covers, and best of all we now have a cheap Wal Mart air conditioner** sitting over our berth hatch. Speaking of air conditioners, please don't ever waste your money on one of those horribly expensive units from West Marine. When we suddenly headed out last year and knew we would be in mosquito territory while crossing the Okeechobee, we panicked and without doing the proper research (my job) we bought one. We are now on our third unit. Number one lasted from August through September (2011). Number two from Memorial Day to the end of July (2012). Number three from July until.... we're just waiting. The control knobs on all of them broke within the first couple of weeks, they are noisier than hell, inefficient, expensive to run, and the first two gave a hideous last gasp before expiring. The only reason we're still stuck with one is because West Marine won't give us our money back. So we continue to take advantage of the extended warranty which will hopefully allow us to replace it for the rest of our lives, or until we get totally sick and tired of it. So then our refrigerator decided (as would I ) that August would be a delightful time to go on vacation. I discovered this only after a grocery shopping trip which of course involved many items that don't do well in the heat. I was a bit puzzled when I realized that the frost build up on the freezer compartment had diminished quite a bit and I grew alarmed when it was obvious that the inside of the fridge was as warm as the outside. This was on a Thursday. I defrosted the whole thing in a weak attempt to jump start it but by Friday I knew we were up that proverbial creek. I guess that hair dryer may as well be used for something! So while Hans was at work and I was Kravitzing around the marina, I whined about our plight to anyone who would listen. I know one of my last posts put a 'not so nice' slant on the topic of neighbors and I now feel it necessary to post about the ever so elusive 'good neighbor'. And one of these people would be Brian from the Blue Moose. Brian is a natural born Mr. Fix-it and he volunteered in a heart-beat to check out our system. This was after he'd spent the day insulating the attic of a friend's mother and most likely would have preferred relaxing with a beer. But before I knew it he was sweating in our engine room and replaced both of our refrigerator fans that were no longer working (we never even knew they existed!) 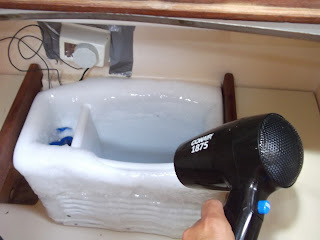 (and at a fraction of the cost if we'd gone with the West Marine model) and when we still weren't cooling by the next day he charged up our freon. A couple of tweaks later (he even consulted with Mike from Zero to Cruising) and a very cheap visit ($40.00) from Captain Ron the refrigerator guy (who verified we didn't have a a leak) we were back in business and I spent the next few days lifting the lid of our refrigerator just so I could enjoy the feeling of dry, cold air***. When Brian and his wife Sally leave here after Hurricane season we'll miss them (that is if we don't follow them). They are super nice people. But then again, they are sailors. Last month we enjoyed a cook out at the marina and another one is scheduled for this weekend. ** I no sooner wrote about how wonderful our Wal Mart air conditioner was when it too crapped out on us. We took it back and since it was under warranty we could have received one in exchange. Except they didn't have any (they're now stocking electric heat logs!) and we're now back to camping out in our salon area on our 'just slightly smaller than a double bed'. 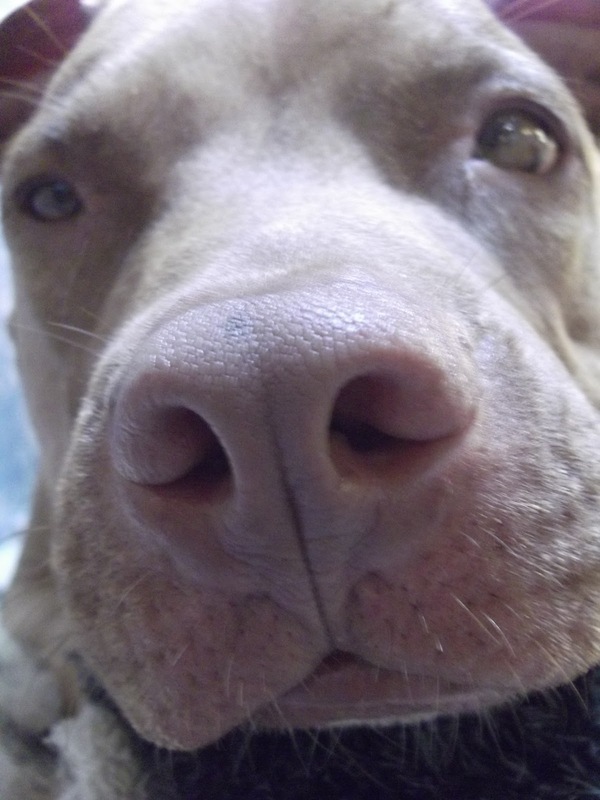 Remember this includes Wilbur the Amazing Expanding Pit Bull. ***After yet another provisioning type of trip to the grocery store I discovered that the fridge had enjoyed its vacation so much the first time that it skipped out on us yet once again without any kind of prior notice! This time it was our freezer 'plate'. It was leaking freon like no one's business and of course needed to be replaced. We now have a whole new refrigeration system. I find it a bit strange though that three boats here at the marina suffered from 'fridge failure' within the same week, not to mention those with air conditioner issues. And last week we saw at least three toilets in the dumpster! You can't tell me that appliances don't belong to some sort of union because I'm convinced they all conspire to kick the bucket at the same time. We no longer discuss our outages while on our boats and instead huddle in the parking lot in order to compare notes of failing systems. Having once belonged to a union (and there is strength in numbers) I feel it's best to keep our appliances in the dark as much as possible.